Probably one of the easiest recipes out, yet one of the most tasty and also one of my favourite breakfasts or brunch. 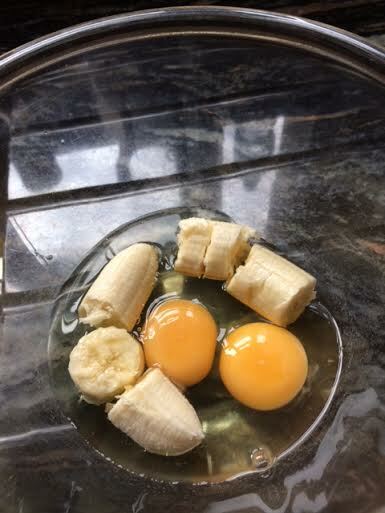 All you need are two eggs and one banana in a glass bowl. The riper the banana, the better. Whisk together until light and frothy. I use my trusty handheld Kenwood electric beater and it takes just a few seconds to break the bananas down and whisk until frothy. At this stage you can add a tablespoon of coconut or buckwheat flour – just whisk in. It does make the pancake easier to flip although I often make them without any flour. Heat a little coconut oil in an omelette pan and pour a little batter into the hot oil. Once the pancake starts to set and bubbles rise, flip over for just a few seconds to brown the other side. Serve with your favourite berries and a drizzle of honey or maple syrup. These pancakes are much lighter and fluffier than traditional flour/egg/milk ones. 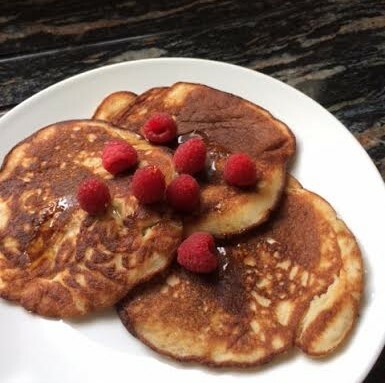 This entry was posted in Breakfast and tagged Banana, Breakfast, Egg, Gluten Free, Healthy Eating, Pancakes, Recipes. Bookmark the permalink.